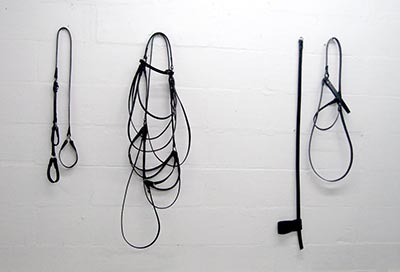 Simona Brinkmann, Non- Specialist, 2010, burnished leather, screws,75cm x 57cm x 40cm. 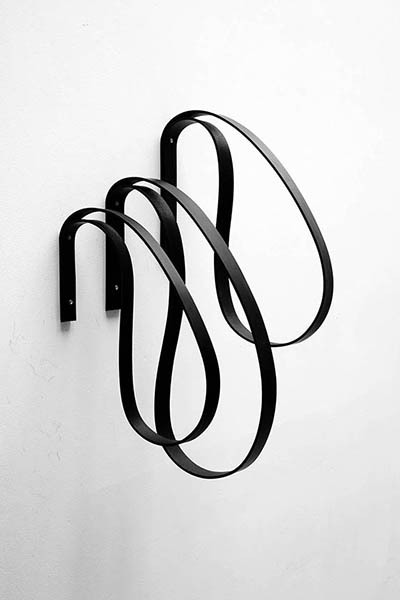 Doors Become Bridges, 2012, Steel, graphite, leather, metal fittings. 300cm x 210cm x 20cm. 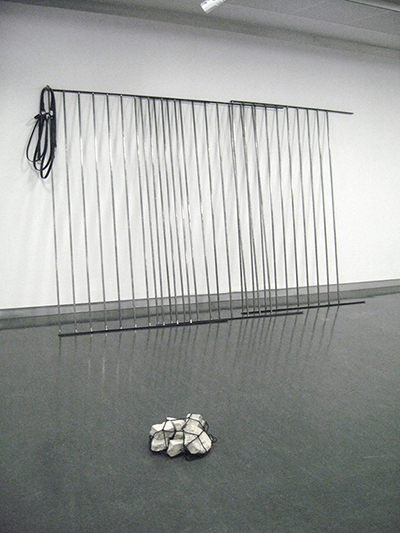 >Foreground: Panorama, 2012, Concrete rubble, cargo net, Dimensions variable. 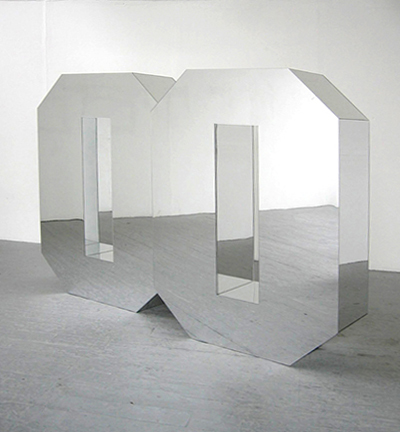 Simona Brinkmann, Doublezero, 2006, MDF, mirrored acrylic,163cm x 226cm x 40cm. wood, metal hook, antlers, dimensions variable. 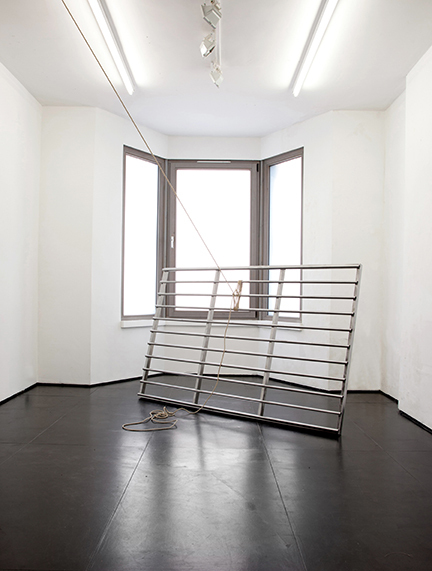 chromed cast brass plum bob, rope, 200cm x 190 cm x 175cm. 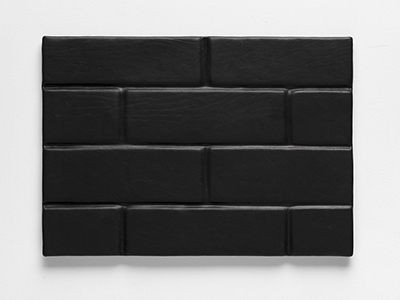 Simona Brinkmann, Canyon , 2010, 30cm x 42cm, foam, board, leather. 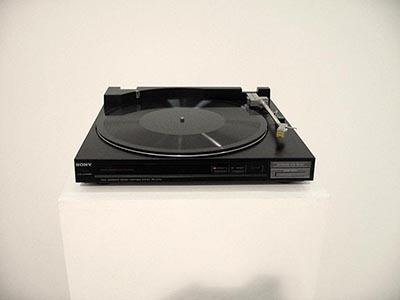 A 12'" dub plate recording of the looped sound of a needle stuck in a groove. 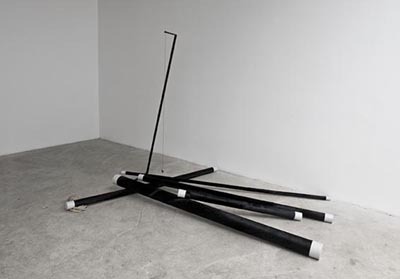 Simona Brinkmann’s sculptures address the fetishisation of objects and the shifting demarcations of public and private. Her choice of materials (leather, metal and glass ) deconstructs the architectural interior and emphasises partitions and movement control. Her references are wide -ranging: fences scaled up or down, revolutionary barricades, crowd barriers or flood barriers and cattle guards used for animal control in the food industry. 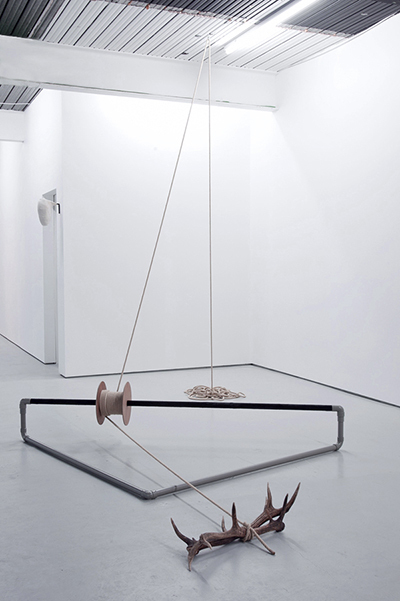 She subtly subverts her original sources by hand-making the objects and displacing them from their familiar use environments to the gallery space. 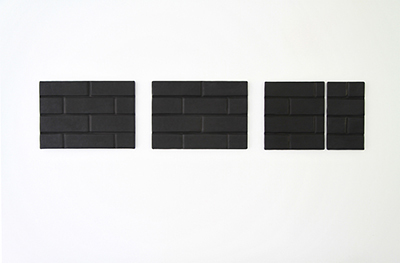 Brinkmann’s sculptures covet weightlessness. Her objects are suspended or leaning, mobile or modular and can be applied in different locations or situations. They allude to a game of power and control, yet, they remain unstable propositions which are easily reconfigured to change meaning. 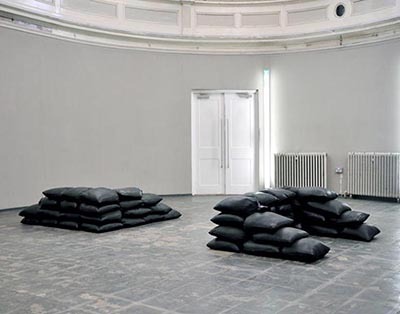 Control lite – where the fetishistic aspect is never fully realised, a slippage which results in a political rather than a personal reading of the work. The politics of enclosure are exemplified by the throught-provoking sentence by Gilles Deleuze “The coils of the serpent are even more complex than the burrows of a molehill” . At the intersection of the political and the personal in her work lies the possibility of a feminist reading. It is not overtly emphasised but also not obfuscated. 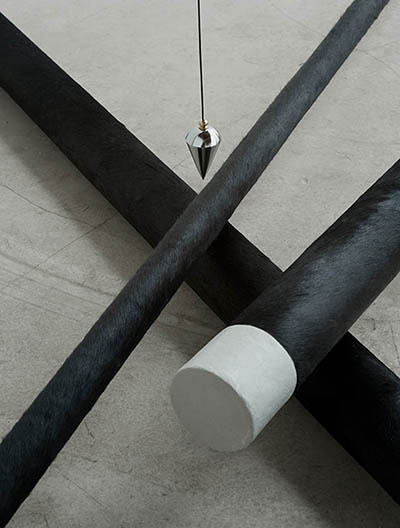 Compounded by their elegant appearance and strong sensory quality Brinkmann’s sculptures can be read as a feminine take on existing power structures, adding a fresh voice to conceptual works on power structures by women from the mid-Eighties onwards. Simona Brinkmann was born in Milan and lives and works in London. 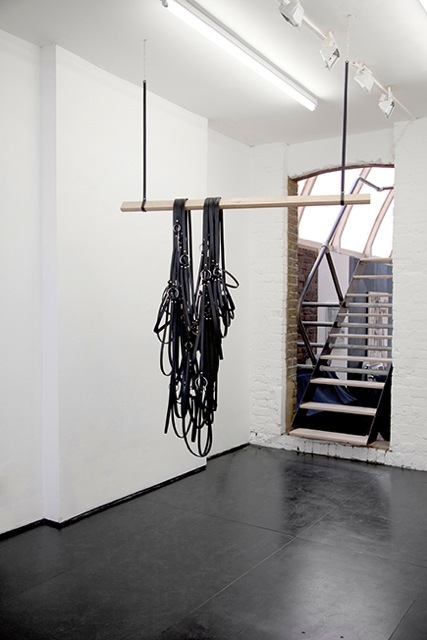 She has exhibited in the UK and internationally, including at Maria Stenfors, London; Zabludowicz Collection, London; MOT International, London; Treignac Projet, Treignac, France; Netwerk Centrum voor Hedendaagse Kunst, Aalst, Belgium; Marc de Puechredon, Basel; Kleio Projects, New York; and the ((audience)) festival of surround sound art in New York, Syracuse and Toronto. She was the recipient of the Clifford Chance Sculpture Award in 2007, Artist In Residence at Kingston University in 2011/2012 and at the University of Hertfordshire (2013/2014).